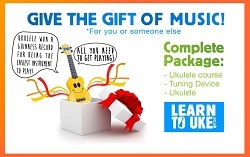 Buy someone you know a gift voucher to come along to a Ukulele Taster Class. They can choose the date that suits them best and book in with the code you give them. The email containing the gift voucher and your own personalised message can instantly be sent to the recipient along with full instructions on how to redeem the voucher and book their chosen class. Or, if you’re planning a surprise, you can have it sent to yourself, then forward the email to them later.